I bought this used with a few blemishes at a rummage sale with a bunch of other Denon gear (apparently pulled out of a house for a audio/video refresh). Of the 28 I spent on it all (6 or 7 pieces), $3 was spent on this unit so as can be imagined this value is high to me. Plugged it and other pieces in (pulling my old Sony crap into storage, and eventually to recycling center) and they just worked fine. Used 100% for audio so far, can't comment on DVD features or controller (missing in action), or controlling other units like a 100 changer. But can comment that most standard CDs play just fine as I don't have HDCD. The unit apparently doesn't do SACD/XRCD, but seems to have a 24/96 decoder for the higher def audio on the DVDs (again, haven't tried it so no comment). I have these hooked up to a $8 Denon AVR-3805 from same purchase (5-7 channels at 100+ watts with 8 ohm, and 120+ on same with 6 ohm) driving some ADS L1590/2 (got for free), and some less than 1 dollar CDs (all classical). Makes for a simple cheap usable sound system, albeit old and rather ugly to the significant other, very easy listening to me. Total value, very high to me, total cost very low, total reliability very high. I never understood the following of Denon. EVERY SINGLE STEREO COMPONENT I HAVE EVER HAD has broken down within 3 years. Some breaks were very minor, and others were major. I had an amplifier years ago that I spent more than $1,500 and within 3 years the left channel no longer worked. Had it fixed, and within another year the right channel didn't work. This is my second Denon 5 disc changer I've owned and the first part I hated was that I could not play a burned disc on it. Then, if you had an audio or any other kind of DVD that had the SLIGHTEST up grade to it whether it be audio or video, it couldn't read it. God forbid I try to play an SACD, it has NO IDEA what to do with that. Now, I have to nudge the tray to close when I hit the close button (I've had to do that for the past 3 years) and I just purchased a brand new REGULAR CD from EMI. "NO PLAY" is all I get. I continue to get this on many other REGULAR FACTORY/RECORD COMPANY CD's more and more frequently. I've had it. I will NEVER EVER buy another Denon product again. They are overpriced pieces of garbage. I thought after the first CD, "OK, I got a lemon. You can't keep getting great reviews if all your components last like this." So, like an idiot, I gave them another chance. Same thing with the Amp, and now this is the final straw. I am now going to take this to a field and re-enact the scene from "Office Space" where they take a baseball bat to the copy machine. That is the ONLY thing Denon products are good for: Destruction. This unit has always sound great and had an excellent picture. The picture started messing up, similar to the horizontal hold being stuck. This has gotten progressivly worse, until you can't watch a movie at all. First let me say that when this player worked it was unbelievable. I bought this refurbished by Denon with a 90 day warranty. It seemed like a good deal with the 1200.00 list. Similar problems as other reviews such as skipping in the middle of play or stopping, no cdr/rw, and unorganized remote. All was fine till this last week. An hour into a DVD it goes schizo with ditigal bars all over the picture and intermittent sound. Shi# canned it and bought a new phillips with progressive scan, not the same but works. all in all, I still love this unit. picture is great,sound is great for the money spent. besides whats already been mentioned, No CD-R, the remote, the noisey operation of the unit. but we can all nit-pick the little things that made even smaller when you start to encounter problems as i've mention above. this is a follow-up to a review i wrote about 2 years ago when i first purchased my DVM-3700. over the past 2 years it started with the unit skipping to the next disk in the middle of a movie. in the begining it was a rare thing for the unit to skip to the next movie but became worst as time went on. now it has problems recognizing the dvd's even new ones. a message keeps poping up saying "unit cannot play this type of disk,insert another disk." even though it's played the disk in the past with no problems.i've used a dvd lens cleaner and the unit is unlocked to play all ratings of dvd's. and yes i've even tried to initialize the unit a number of times and nothing helps. the unit has a 3 year extended warranty i purchased at Tweeter and will be going back tomorrow. so for those of you who are already experiencing the skip to the next movie syndrom in the middle of the movie you are already watching,get your unit to the shop before it's too late. if you didn't purchase an extended warranty as i did you have about a year before the denon's run out. and thats where it all started about a year ago with the unit skipping to the next movie and it's been going down hill ever since. None.., dedicated to denon products only. DVD playback, Burr-Brown D/A, CD playback (hdcd) etc.. Remote is a little cluttered and may be hard to operate for some. Somewhat noisy during disc changes. When I set out to purchase a DVD player, I wanted to utilize the technology that DVD has brought to market. The ability to play CD-R's etc.. wasn't a big concern to me, as I was buying a DVD player, to play DVD's. And what a DVD player it is. One of the best pictures I've ever seen from a mass market mid -fi player. The reote left a little to be desired, as mostly it has real small buttons and I have real big fingers. It's layout is fair-to-good. The changer mechanism is a bit noisy, but that didn't really matter to me as it does to most other reviewers. The D/A conversion is top rate, and the analogue connected to my B&K Reference 30, it sounds totally awesome. The video is stunning!! This is primarily a DVD player, when it was designed, that was it's main objective. I have not encountered any problems with operation whatsoever. If your looking for a high quality carousel DVD/CD changer, this unit is hard to beat. Audio quality is first rate connected digital optical to Denon AVR-5700. Even rivals some dvd-A; example: Blue Man Group in AC-3 mode verses DVD-A mode w/ Technics DVD A10. HDCD is stunning and 24/96 Chesky disks are pristine. Video quality is also first rate connected to Toshiba HDTV Widescreen w/ component video. Important to set up video w/ THX optimizer to appreciate low level and below black pluge. Player does randomly change disks for no apparent reason - may be related to IR (ifrared). Have had unit for over a year and now experiencing "NO PLAY" on some DVD''s like Toy Story 2; has difficulty reading second layer of "Dances w/ Wolves" - jitter and sometimes freezes up. 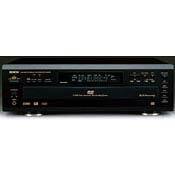 No problems whatsoever with cd''s and even dts cd''s; Looks like I''ll be in market for a new DVD player soon - but will keep the 3700 for cd''s - nice changer, but not as quiet and fast as previously owned Denon products. I think this is a very good DVD changer. It''''s well-built and high-quality, except for the rather flimsy plastic internal CD platter. DVD visual is very good, pretty much rivaling progressive scan players, and the DVD audio is just great. The analogue output is essentially audiophile quality, particularly when playing high fidelity CDs, like HDCD, or 20-bit 138X oversampled disks (like the Chesky label). I''''ve got mine biwired to my Denon 3801 receiver, with analogue outs for CD play and a digital coax out for DVD play. The remote is a diappointment, it''''s tiny and tinny. The only universal complaint I have against Denon is their consistently substandard remotes. As well, disk changes are more noisy than I expected. This is nit-picky, but the numbers printed on the internal DVD platter are nearly impossible to read. I wish the 3700 read CD-R, CD-RW, MP3, DVD-R and the like, but that''''s just the way it is. I looked at the Onkyo and HK DVD changers, and while they sounded good, I was scared off by consistent reports of reliability problems. After hundreds of CD and DVD plays, my 3700 refused to read a disk only once. I re-booted and never had another problem -- so far so good. Overall, it''''s a geat DVD player with superb CD fidelity. I recommend it. Excellent video, natural sound, random 5 disc, effective GUI and nice remote. You have to use the skip button for the player to recognize all the discs. This really in not that big of a deal. After a long wait and what seemed endless research on DVD players, I chose the Denon DVM-3700. This is a well built (sturdy-20 lb), attractive, high-end 5 disc DVD player that doubles as a quality cd player. I use a Sony 50ES reciever, Sony V series TV and Paradigm speakers. I also used a digital coaxial cable for the video and the optical cable for the cd player. The analog outputs really fall shy of the digital outputs. This unit has all the latest advances and it shows-clear video and balanced sound. The menus are excellent with features that are easily adjustable and accessible through the GUI. It has a ALPHA 24 processor and HDCD decoding that their top of the line DVD and CD player have. I use it for both CD and DVD playback and could not be happier with the performance. It even has a nice remote. Best AV setup for the money. I like the video settings that change the picture from normal to soft-with user settings. The front panel is aluminum and nice looking. The dot spacing is tight in the display. The blue dot goes well with the blue light from my reciever. The Burr-Brown DAC's are impressive. At least with Denon, they use quality parts. I have seen (or heard) no glitches so far and I am very impressed with this player. I paid $900 (300-400 for a quality cd player, 600+ for a DVD player) and got a changer thrown in as well. You won't go wrong buying this quality Denon DVD player. none, but auditioned a few good ones. Remote is small - keys tiny. I bought this unit along with the Denon AVR-5700. They make a very compatible pair. I am very satisfied with the overall CD performance. It is so much better than the old Sony unit it replaced that "exponential" is not too much of a superlative to apply. The video is superb. I am very happy with DVD quality and DD 5-channel audio. The 5700 has some interesting DSP modes which go well with some of the oldies CD's I like to play sometimes, including "5-channel stereo" (a term which might be an oxymoron). I paid $mid-600 for it at a mid-to-high end dealer. He gave me a pretty good deal since I got the 5700 at the same time. I am not a self-proclaimed audiophile. This combo is all I want or neede.